Celebrating the field teams and their achievements and planning what's to come! 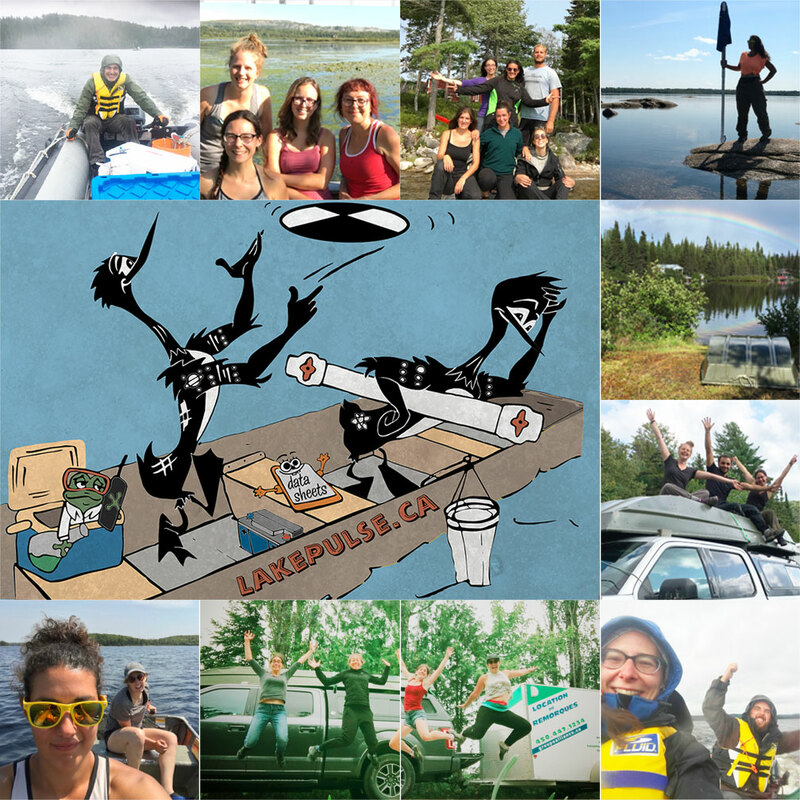 Our field teams have just rolled in from sampling 217 lakes, and everyone wants to see… data! Join us at our 2nd Annual Network Meeting! Who is invited? Lake Pulse participants! Enter your name and email address below to register. HQP workshop: Monday, November 6, 2017 (1-6 p.m. in L1-12745). An HQP networking event (dinner, beer night) will be held in the evening. Morning break: 10:15 to 10:30 a.m. Afternoon break: 3:15 p.m. to 3:30 p.m. Discussions within projects on upcoming work, sample processing, thesis work, etc. *Agenda is subject to change. Prepare a presentation/video or lighting talk under 3 minutes in length. See the video in our latest blog post on "Lake colour" for ideas, but use your creativity. You can include photos and videos from your field work and from the lab. Possibilities include using iMovie (Mac) or PowerPoint (with or without voice-over narration). Save your file in mp4 format and submit to Catherine by Monday, October 30th, 2017. Ideas: Highlight your project by describing your goals and work. Indicate which field samples are used, and what types of data or results will be produced through your analyses. Identify how your project fits into the broader Network. Highlight potential connections to other projects within Lake Pulse. Come to discuss your projects, participate in workshops and working groups, and help plan the next field season. It is also the perfect time to reach out to partners to join your projects. Contact Catherine if you need to reserve a room to hold a discussion with a smaller group on the afternoon of Wednesday, November 8, 2017. We need your expertise to improve all aspects of Lake Pulse from data processing to publications. During the annual meeting, we invite you to participate in a three-question interview that we propose to record. We can produce a short video to highlight your role in Lake Pulse. Feel free to supply photos and text. For an example, check out this video or suggest your own ideas! Or, feel free to make your own presentation/video to present at the annual meeting. Possibilities include using iMovie (Mac) or PowerPoint (with or without voice-over narration). Save your file in mp4 format and submit to Catherine by Monday, October 30th, 2017. Let us know if we can post the videos to our website! Time to join in and play! We have visited Québec, Ontario, New Brunswick, PEI and Nova Scotia this year. Next year, we'll likely be in Newfoundland and Labrador, Manitoba, Saskatchewan and Alberta. There's no better time to come and learn about what we've been collecting, get updated on our future plans and discuss any improvements we could make to our field campaigns to make them more relevant to you. With data under our belt, the Lake Pulse team is ready to engage even more with our partners and orient our work to better serve their needs. Come to meet other participants and take an active role in the different projects that are relevant to you. Many partners will provide data over the next year, so this is the perfect time to chat with our database specialist, Jelena Juric. The Network Meeting is a great opportunity to meet our core team of Lake Pulse professionals! We are ready to discuss your data needs and expectations as well as your field campaign ideas! Travel and meal reimbursements: After the meeting, you will need to send scanned receipts for your travel (including boarding passes for plane travel) and accommodation to Catherine Brown with this form (if you need assistance, ask Catherine). Note that lunch will be provided on November 7 and 8, and we have reserved a room and buffet for our group at the Sandman Hotel for the evening of November 7. Most hotels provide breakfast included in their rate. If you have additional meals that need to be reimbursed, the costs covered are as follows: breakfast $10.40; lunch $14.30; and supper $22. The Network provides reimbursements for our students, postdocs, research professionals, co-PIs, Scientific Committee, Board of Directors; NSERC rules do not permit reimbursements for our partners, collaborators or summer student interns. Questions? Feel free to get in touch with our Network Manager with your comments or queries. 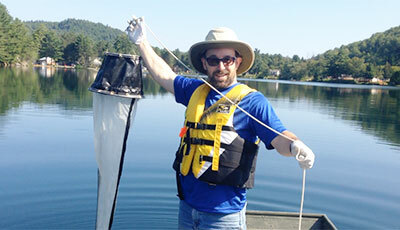 Get your Lake Pulse t-shirt... For the lab, lakeshore, classroom or office! 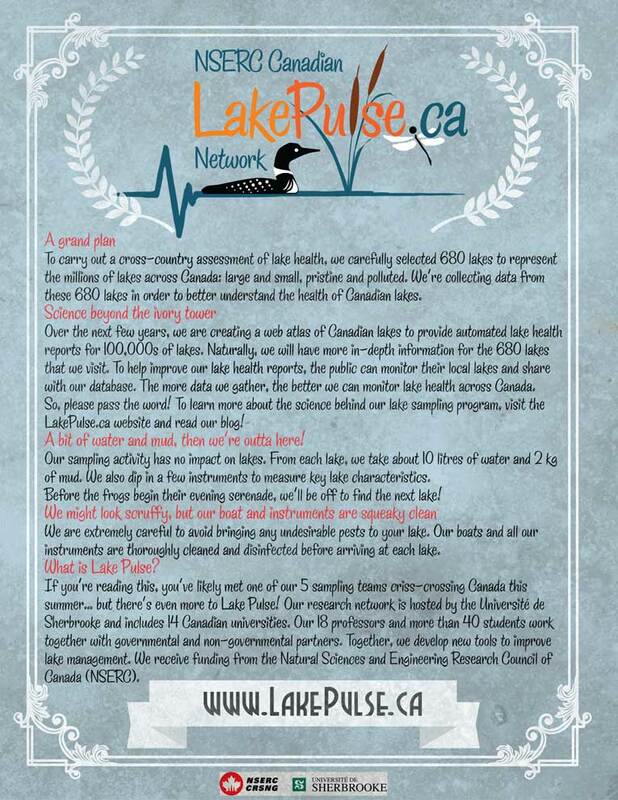 The NSERC Canadian Lake Pulse Network is a scientific initiative on environmental issues affecting Canadian lakes. It brings together experts in lake science, spatial modelling, analytical chemistry, public health, remote sensing, amongst others. 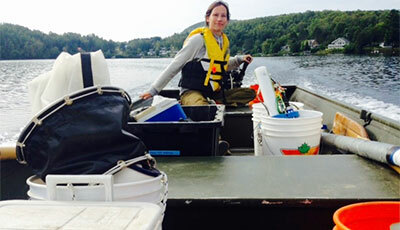 The impacts of land-use changes, climate change and contaminants are assessed while developing new tools for lake stewardship. We are supported by an NSERC Strategic Partnership Grant. 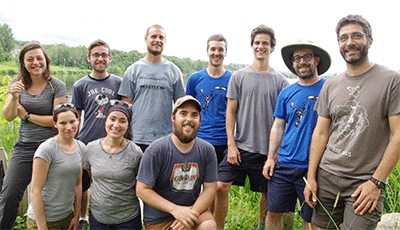 Our scientists provide students with interdisciplinary training and inspire them to face freshwater challenges with a collaborative spirit and scientific rigour. Water managers, municipalities, lake associations, governments and non-governmental organizations all need access to lake health and watershed information, especially to support decision-making and guide policies. 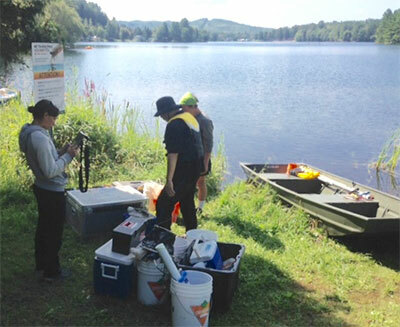 We coordinate with diverse groups to ensure that our LakePulse.ca Water Portal will provide relevant and accessible information based on results from our projects. 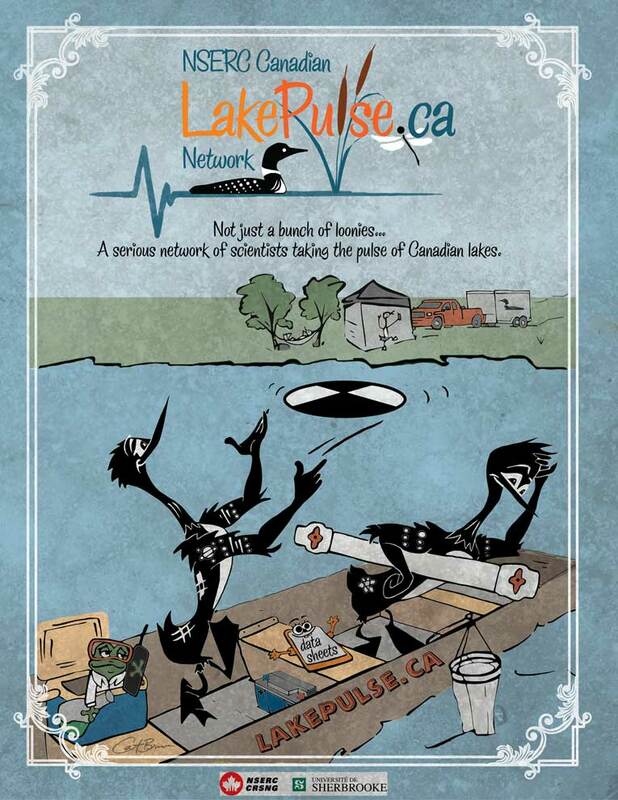 The LakePulse.ca Water Portal will provide interactive maps on the health of Canadian lakes and on regional threats.